Miami Trace’s August Langley (10) makes a dive at the ball during a Division II District semifinal match against Alexander Wednesday, Oct. 24, 2018 at Logan High School. 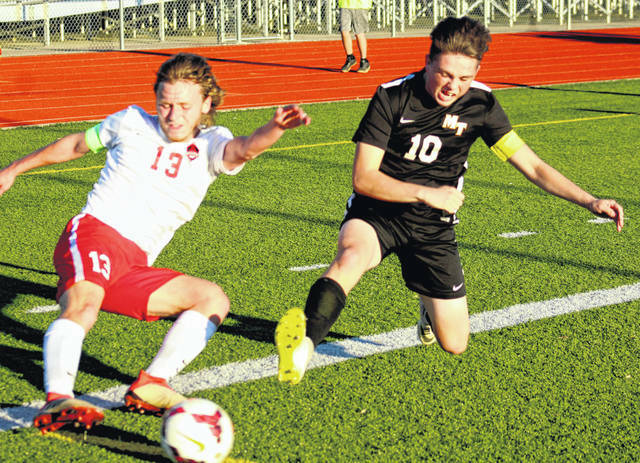 LOGAN — The Miami Trace Panthers made the trip down into the Hocking Hills Wednesday to take on the Alexander Spartans in a Division II District semifinal soccer match-up. The game was scoreless for the first 61 and a half minutes. Then with 18:26 to play in regulation, Alexander scored the first goal of the evening. Just over one minute later, and the Spartans had scored again on their way to a 2-0 victory over the Panthers. Alexander will return to Logan High School Saturday for a District championship match at 4 p.m. against the Circleville Tigers. Circleville defeated Jackson in the second game Wednesday night, 2-1. It was a defensive struggle between the two sides Wednesday. The score was 0-0 at halftime and it appeared as though the match was headed for overtime. The Panthers did have one of their strongest chances to score with back-to-back shots on goal less than three minutes into the second half. Tyler Fritchley scored what proved to be the game-winning goal for Alexander, assisted by Parker Bowland with 18:26 remaining to be played. Bowland scored the second goal with an assist from Todd Norris at 17:12. Alexander improves to 8-7-3 on the season. “August Langley getting hurt really affected us defensively,” Miami Trace head coach Josh Thoroman said. Langley had to exit the match early, but did re-enter and was again on the turf in the second half. Miami Trace ends the season with a record of 11-5-2. The Panthers say thank you to their seven seniors: Drew Batson, Wyatt Cory, Sebastian Gurruchaga, Devin Howard, Cole Howland, August Langley and Coby Seyfang. They finished their career with a combined four-year record of 34-33-5. “They may be the first class to go through with a winning record,” Thoroman said. This is the 30th anniversary of Miami Trace boys soccer, the program having started in 1989. Alexander had 21 shots on goal to nine for the Panthers. Justin Shoemaker had nine saves for Miami Trace. Connor Truex had five saves for the Spartans. The Miami Trace soccer program had six players receive All-Southeast District honors, as voted by the coaches. Caleb Perry and Drew Batson were named First Team, All-District. Kody Burns and Justin Shoemaker were named Second Team, All-District and August Langley and Kyler Conn were named Honorable Mention, All-District. Conn finished the season with 15 goals. Sean Sweeney was named the Southeast District Assistant Coach of the Year. Caitlin Francis, the Miami Trace Lady Panthers head coach, was named the District Coach of the Year.